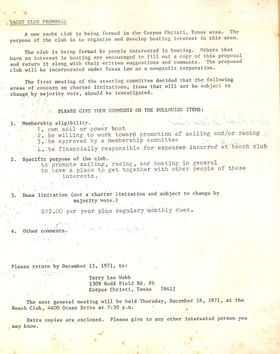 In 1971, a group of 45 young people from Corpus Christi interested in water related activities met to form The Bay Yacht Club in the Old Beach Club (long gone, next to present Landmark Condominiums on Ocean Drive). 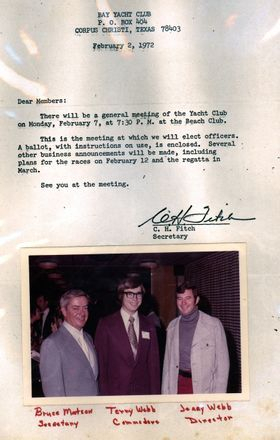 The first officers and directors were elected in January 1972, and a burgee was selected. A committee was set up to begin planning a new facility. 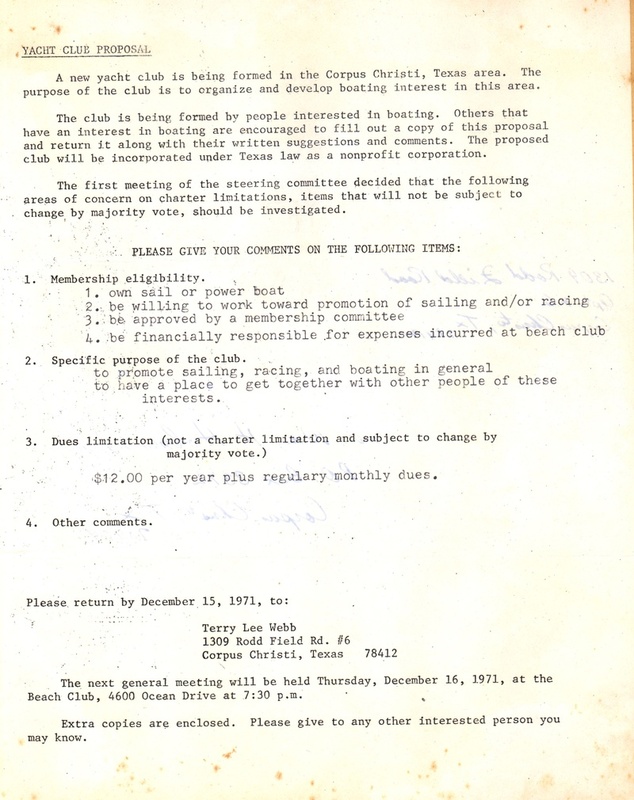 In July of 1972, the membership voted to acquire a floating facility to be moored in the downtown marina that would serve as their new home. The first clubhouse was built by the members themselves, on weekends and after work. It was a 25x68 feet, with limited kitchen facilities, two bathrooms, one large air-conditioned room and an upper sun deck. It was moored at the end of "B" Pier. The facility was replaced in 1986 by the next clubhouse, built on a 30x100 feet barge, and had full kitchen facilities, bathrooms with showers, one large gathering room, an upper lounge and an upper sun deck. 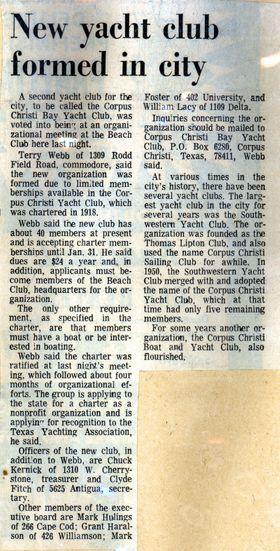 Members and guests enjoyed this facility, moored on “B” pier in the Corpus Christi Marina, for twenty eight years. In 2014, the barge and clubhouse were sold because badly needed repairs to the steel barge were not practicable. The Club moved to 555 South Shoreline Drive, one block from McGee beach on Corpus Christi Bay and three blocks from the city marina. The new clubhouse offered improved access, convenient parking and high visibility to motorists traversing Shoreline Drive. Within the 3,250 square foot facility were a large gathering room for socializing and entertaining, a fully equipped kitchen, a media room for viewing television and movies, a training / meeting room, a library with space for the Club’s ham and maritime private coastal station radio equipment, and cubicles for rent to club members needing space for storage of boating equipment. The Club’s fleet of six Sunfish board boats, previously adjacent to the barge, was located on the Sunfish Dock at “A” pier in the city marina. In August 2017, the Club acquired the former Floridian Star charter dinner ship. The vessel was rechristened as the Bay Star and is docked on the south end of Lawrence St T-Head. Ongoing renovations and upgrades are transforming the vessel into a first class ship capable of leaving the dock and cruising Corpus Christi Bay. To learn how we came to acquire our new club, please follow this link: History of the Bay Star. 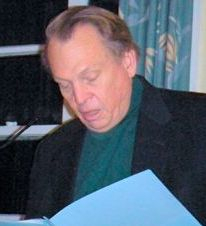 It has been a tradition for the year's events to be captured in a poem. 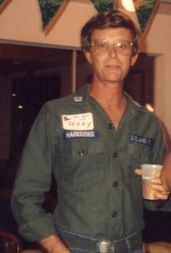 Terry T. Harkrider Award was established to honor Terry T. Harkrider, who gave his time, service and knowledge selflessly to The Bay Yacht Club as well as to individual members during his membership. Harkrider died much too young of cancer in May 1990. The recipient of the award, beginning in 1991, is a BYC member serving in the same vein as Harkrider's example. "Much of the finish work you see inside the club is a result of Terry's hard work and dedication to completing the club in 1987." 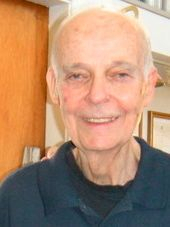 - Hal Peterson - November 2009. After the death of Bob McNeill in 2009, the Board of the Bay Yacht Club decided to create and display a memorial plaque in honor of Joanne and Bob's service to the club. During the 2010 Installation Banquet the plaque was presented by 2009 Commodore Walt Crawford to their son, Chris McNeill and daughter Kathleen McNeill Murch. Joanne - Director - 1997, 1998, 1999, Social Chair - 1998, 1999, 2000, Dinner Chair - 2001, 2002, 2006, Commodore's Trophy - 1998, Terry T. Harkrider Outstanding Service Award - 1999. 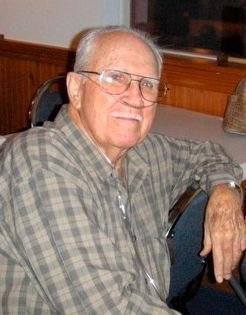 Bob - Rear Commodore, Docks and Facilities Chair - 1996, 2001, Commodore - 2002, Treasurer - 2004 thru 2009, Commodore's Trophy - 1996, Terry T. Harkrider Outstanding Service Award - 2004. 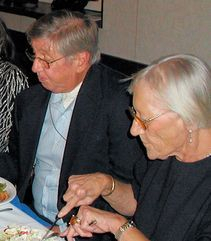 The Bay Yacht Club will forever be indebted to the honor and service these two individuals gave to the club. The Memorial Plaque hangs on the south wall of the club by the door. This is a salute to our members that have taken the everlasting sail to distant horizons. Our prayers and thoughts go with them. Thanks for the memories.